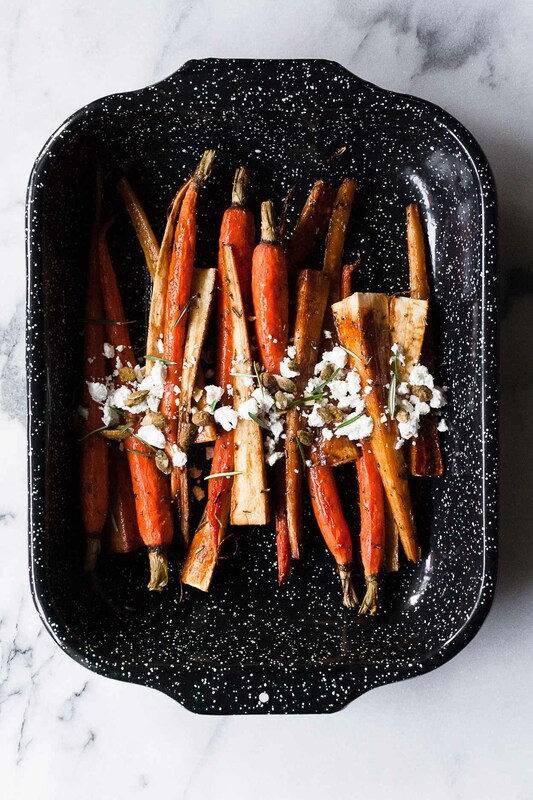 The simple mix of sweet and savory combines to make these spiced roasted parsnips and carrots your new favorite side dish! Easy enough for weeknight meals and fancy enough for holiday parties! I feel like I have to ask… how was your Thanksgiving? Did you do the cooking, the baking, the hosting? Or are you more of a ‘I’ll bring the best pumpkin pie you’ve ever had’ kind of person? Usually I am in camp #2, but this year Pat and I hosted his family for the big meal. Leading up to the day, I was pretty intimidated and a little overwhelmed, even though there were only seven of us. I’ve hosted dinner parties larger than seven before but … but THIS WAS THANKSGIVING! It’s just different. You get it. But I am happy to say that the meal went off without a hitch! We smoked the turkey (helllllo GAME CHANGER), skipped the stuffing, and opted for 3 desserts. So yea, it was pretty darn good. Parsnips are a vegetable that I never had growing up – in fact, I think I had them for the first time 2 years ago. But ever since that day, I’ve been hooked. 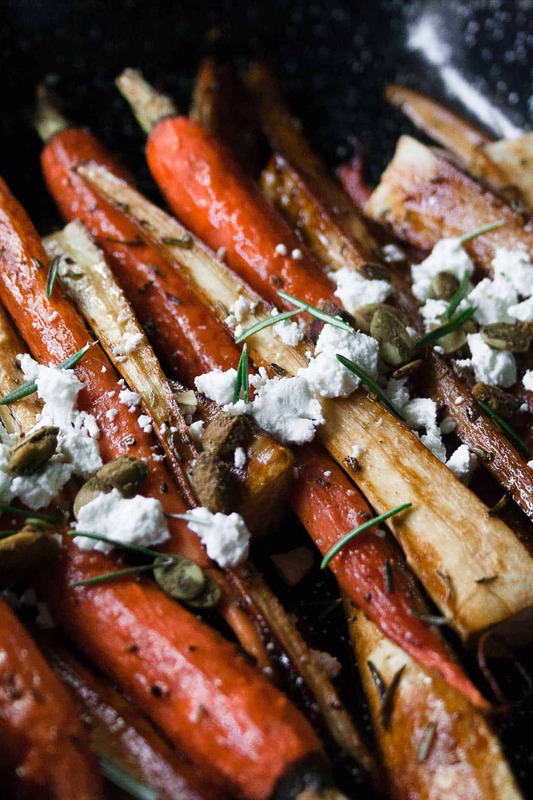 These roasted parsnips and carrots are the perfect mix of sweet and savory thanks to my new favorite item >> DATE SYRUP! Date syrup is literally what it sounds like – a sweet syrup… like honey or maple syrup or molasses but made entirely of dates. And the dates make the syrup lower in sugar than the more traditional options. Oh and I should also mention, it tastes wonderful as a sweetener in your morning coffee, drizzled on top of ice cream, and pretty much any thing you can think of! I added some fresh rosemary to the vegetables when roasting because rosemary is my NUMBA ONE. And topped them off with a few goat cheese crumbles and pepitas. Yum! 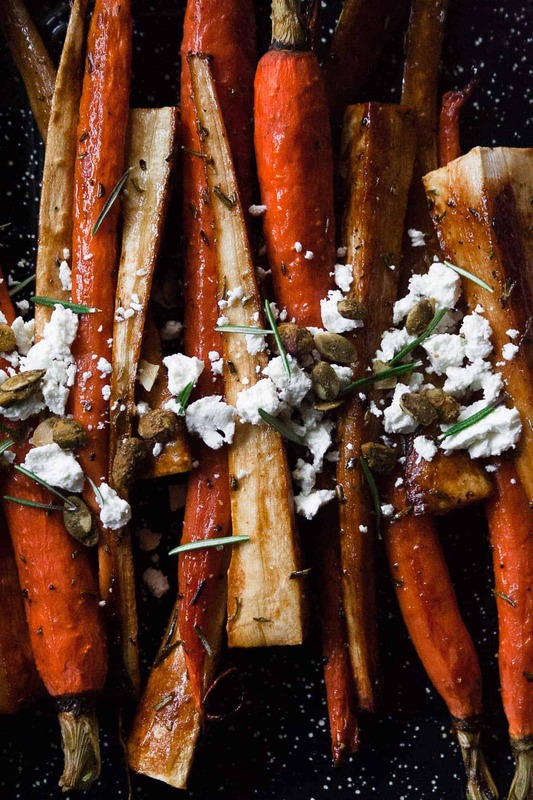 I know you are going to loooove these spiced roasted parsnips and carrots!! Make them for your fam this weekend and post a picture on social media – use the hashtag #imhungrybynature so that I can see! 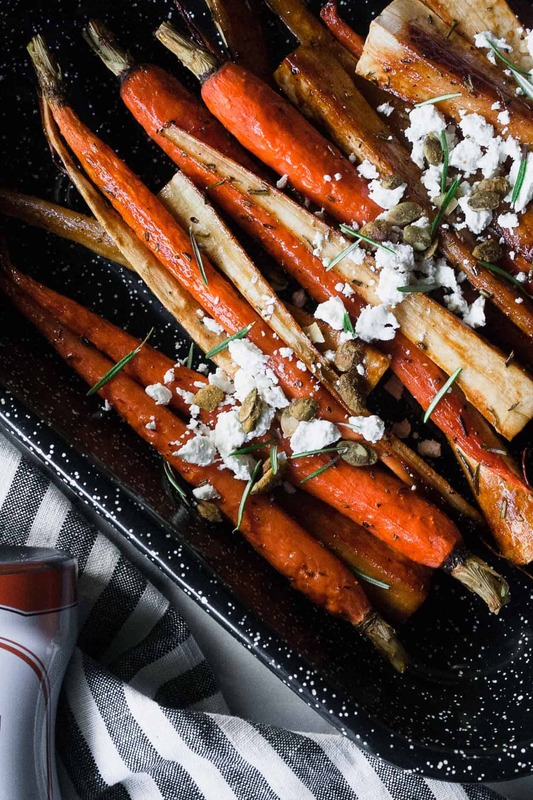 Slice carrots and parsnip so they are roughly the same size and place on a baking sheet. Drizzle with date syrup, olive oil, rosemary, salt and pepper. Toss to combine. Roast for 40 minutes, flipping halfway through. Top with goat cheese and pistachios. *Can sub maple syrup, honey, or a sweetener of your choice for date syrup!